Pictured here is the Dunkin' Donuts entry way mat and a strawberry iced donut. Which donuts do you prefer? 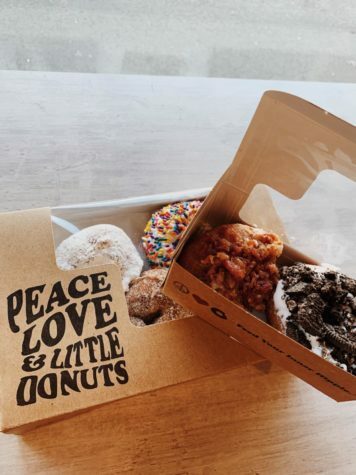 Peace, Love & Little Donuts has cute packaging. Chocolate cake donuts from LaMar’s are delicious. This is the donut case at Peace, Love & Little Donuts. This is the donut case at Dunkin’. Inside Peace, Love & Little Donuts, the decor is so cute. 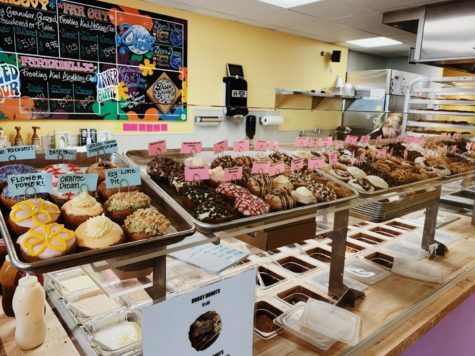 Everyone loves donuts, therefore, finding the perfect local bakery to indulge in is essential. 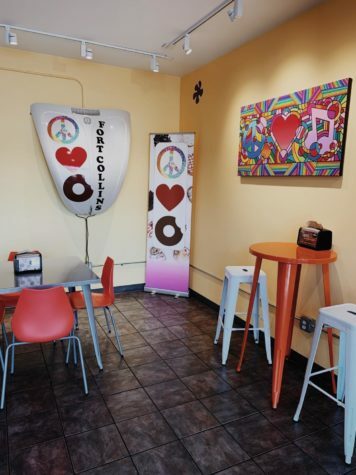 There are many bakeries here in Fort Collins that offer donuts, including LaMar’s, Dunkin’ Donuts, and Peace, Love & Little Donuts. Although they are similar, all three stores offer something a little bit different. I decided to take on the task of taste testing and reviewing the three bakeries. 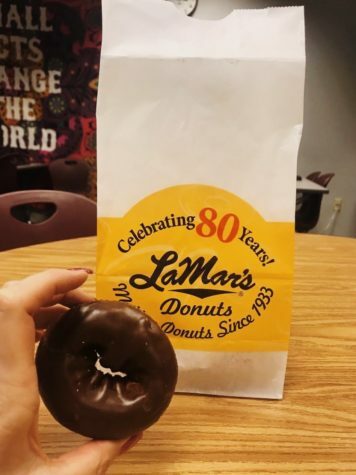 The first location, LaMar’s Donuts, is a chain bakery and has 26 stores in five states. Ray LaMar opened the first LaMar’s Donuts in 1960. The business was a quick success and soon there were daily lines of people outside waiting for their hot, fresh donuts. 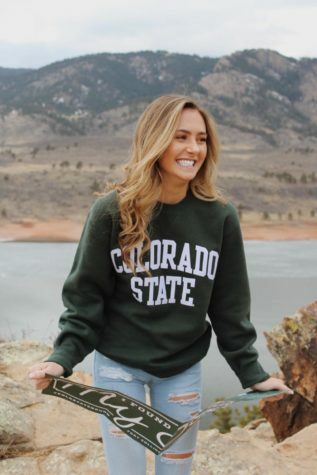 Fort Collins has two locations, one on W. Drake Rd., and the other on E. Boardwalk. LaMar’s offers a wide variety of donut flavors. Their most popular donuts include the Ray’s Original Glazed, Ray’s Chocolate Glazed, and the Ray’s Maple Glazed. While at LaMar’s, I sampled their cinnamon sugar cake donut. The donut came from the case that lines the front counter of the store. It was tasty but pretty standard. The LaMar’s staff was young, friendly, and cooperative. They didn’t mind waiting for me to decide on which donut flavor to purchase. 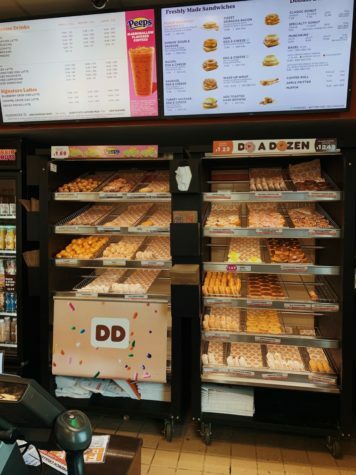 The second store I visited was Dunkin’ Donuts. Like LaMar’s, Dunkin is a chain and was founded in 1950. The Fort Collins store is located on S. College Ave. and also offers customers drive-thru services. Dunkin’ Donuts’ menu is large in comparison to LaMar’s. They serve hot drinks, iced drinks, sandwiches, wraps, and pastries in addition to donuts. Dunkin’ and Lamar’s are both very similar in price–around $1 for one donut, depending on the flavor. While at Dunkin’ Donuts, I sampled their strawberry frosted, sprinkled donut. The cake part itself was light and fluffy. The frosting was sweet and complimented the cake well. The staff at Dunkin varied in age. There was a younger man working the drive through and a mid aged woman working the counter. They were both pleasant but didn’t go out of their way to welcome the incoming customers. The final bakery I treated myself to was Peace, Love, and Little Donuts. Peace, Love is also a franchise and was started in 2009 by Ron and Marci. The first location was in Pittsburgh, PA. The Fort Collins store is located on S. College Ave. This bakery is unique in that it serves miniature donuts rather than the typical sized donut that both LaMar’s and Dunkin sell. Peace, Love also offers creative flavors that the other stores don’t include. For example, I tried the maple bacon donut. The combination of sweet and savory was unforgettable. They have donuts flavored like candy, cereal, pies and much more. The decor in Peace Love also stands out. Everything is colorful and they go for a hippie vibe throughout the store. A single donut is still about $1, but it’s much smaller. After visiting all three locations and taste testing different flavors and styles of donuts, I have came to the conclusion that it is really hard to mess up a donut. Where does one go wrong with fried dough, sugar and frosting? Out of the three, the pricing at Dunkin and Lamar’s is more affordable than Peace, Love. The staff at LaMar’s and Peace, Love worked the hardest, and the yummiest donut would have to be the maple bacon I sampled from Peace, Love. I look forward to returning to all three shops in the near future.